Further testing of Silverplate B-29 aircraft and Thin Man and Fat Man bomb shapes was carried out at Muroc Army Air Field in March and June 1944. Testing shifted to Wendover Army Air Field, Utah, in October. Project Y controlled the scheduling and contents of the tests, which were carried out by the Flight Test Section of the 216th Army Air Forces Base Unit as Project W-47. The tests were supervised by Ramsey until November, when Commander Frederick Ashworth became Parson's head of operations, and assumed responsibility for the test program. 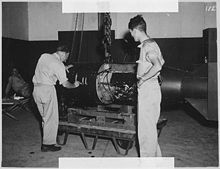 The test bombs were assembled by the 216th Army Air Forces Base Unit's Special Ordnance Detachment. Tests continued until the end of the war in August 1945. 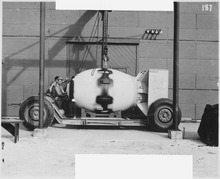 At first only the Ordnance Division's fuse and delivery groups were involved, but as the tests became more detailed, and live explosives were incorporated into the test bombs, other groups were drawn into the test program. In all, Project Alberta consisted of 51 Army, Navy and civilian personnel. Army personnel were two officers, Nolan and First Lieutenant John D. Hopper, and 17 enlisted men from the Manhattan Project's Special Engineer Detachment. Navy personnel were Parsons, Ashworth, Lieutenant Commander Edward C. Stephenson, Lieutenant (junior grade) Victor A. Miller, and eight ensigns. The remaining 17 were civilians. The 1st Technical Service Detachment, to which the personnel of Project Alberta were administratively assigned, was commanded by Lieutenant Colonel Peer de Silva, and provided security and housing services on Tinian. Manhattan Project and United States Army Air Forces (USAAF) officials agreed in December 1944 that operations would be based in the Mariana Islands, and the following month Parsons and Ashworth held a conference with USAAF officers to discuss the logistics of establishing such a base. In February 1945, Ashworth traveled to Guam bearing a letter for Fleet Admiral Chester W. Nimitz informing him of the Manhattan Project.Up to this point it had been expected that the 509th Composite Group would be based on Guam, but Ashworth was struck by the congestion in the harbor and the shortage of construction units there. USAAF suggested that he take a look at Tinian, which had two good airfields, and was 125 miles (201 km) further north, an important consideration for potentially overloaded aircraft. Ashworth toured Tinian with the island commander, Brigadier General Frederick V. H. Kimble, who recommended North Field. Ashworth agreed, and had Kimble hold them for future use. Although Project Alberta had no attack orders, it proceeded with the plan to have the Little Boy ready by 1 August 1945 and the first Fat Man ready for use as soon as possible after that. In the meantime, a series of twelve combat missions were flown between 20 and 29 July against targets in Japan using high-explosive Pumpkin bombs. Project Alberta's Sheldon Dike and Milo Bolstead flew on some of these missions, as did the British observer Group Captain Leonard Cheshire. One serious incident occurred when a Pumpkin bomb was released in the bomb bay of the B-29 Strange Cargo while it was taxiing. The bomb fell through the closed bomb bay doors onto the taxiway. The aircraft and bomb came to a halt in a shower of sparks, but fire fighters doused the plane and the bomb in foam, and the bomb did not explode. The aircraft had to be jacked up to remove the bomb. Project Alberta's scientific and technical personnel departed Tinian for the United States on 7 September. Kirkpatrick and Ashworth remained behind to supervise the disposal of Manhattan Project property. Project Alberta was then discontinued. Most of its personnel were transferred to the new Z Division, which began moving to Sandia Base. ^ Jones 1985, pp. 30–32. ^ Hoddeson et al. 1993, pp. 40–41. ^ a b Ramsey 2012, p. 340. ^ Hoddeson et al. 1993, p. 378. ^ Bowen 1959, pp. 91–92. ^ Hoddeson et al. 1993, p. 380. ^ Ramsey 2012, pp. 344–345. ^ a b Dvorak 2012, p. 20. ^ a b Hoddeson et al. 1993, p. 383. ^ Campbell 2005, p. 45. ^ a b "The Manhattan Project". Array of Contemporary American Physicists. Archived from the original on 4 February 2014. Retrieved 8 February 2012. ^ Ramsey 2012, p. 346. ^ a b Hawkins 1946, p. 286. ^ Campbell 2005, p. 157. ^ Russ 1990, p. 30. ^ Campbell 2005, p. 143. ^ Russ 1990, pp. 80–81. ^ "Project Alberta/Destination Team roster of personnel". The Manhattan Project Heritage Preservation Association. Retrieved 8 March 2014. ^ a b Campbell 2005, p. 156. ^ Hoddeson et al. 1993, pp. 386–387. ^ Krauss & Krauss 2005, p. 19. ^ "Memo Ashworth to Groves on selection of Tinian airbase" (PDF). National Archives. 24 February 1945. Retrieved 5 June 2016. ^ Hoddeson et al. 1993, pp. 387–388. ^ Hawkins 1946, p. 285. ^ Russ 1990, pp. 28–33. ^ Russ 1990, pp. 34–41. ^ Campbell 2005, p. 71. ^ Russ 1990, p. 44. ^ Russ 1990, pp. 45–46. ^ Russ 1990, p. 51. ^ Russ 1990, p. 50. ^ Russ 1990, p. 52. ^ Campbell 2005, p. 27. ^ Campbell 2005, p. 50. ^ Russ 1990, p. 53. ^ Campbell 2005, pp. 46, 80. ^ Coster-Mullen 2012, pp. 100–101. ^ Russ 1990, p. 55. ^ Rhodes 1986, p. 691. ^ Campbell 2005, p. 41. ^ Russ 1990, pp. 56–57. ^ Russ 1990, p. 59. ^ a b "Timeline #2 – The 509th; The Hiroshima Mission". Manhattan Project Heritage Preservation Association. Retrieved 18 May 2013. ^ Coster-Mullen 2012, pp. 34–35. ^ Hoddeson et al. 1993, p. 393. ^ McLellan, Dennis. "George Marquardt, U.S. war pilot over Hiroshima, dies at 84". The Seattle Times. Retrieved 2 February 2014. ^ Russ 1990, p. 60. ^ Russ 1990, p. 63. ^ Russ 1990, pp. 64–65. ^ a b "The Story of Nagasaki". National Science Digital Library. Retrieved 28 March 2013. ^ a b c "Timeline #3 – The 509th; The Nagasaki Mission". Manhattan Project Heritage Preservation Association. Retrieved 18 May 2013. ^ Russ 1990, pp. 72–74. ^ Russ 1990, p. 75. ^ Russ 1990, p. 80. ^ Hawkins 1946, p. 291. ^ Russ 1990, p. 83. Bowen, Lee (1959). Vol. I, Project Silverplate 1943–1946 (PDF). 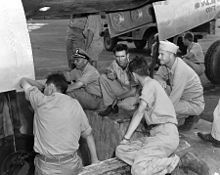 The History of Air Force Participation in the Atomic Energy Program, 1943–1953. Washington, D.C.: U.S. Air Force, Air University Historical Liaison Office. Archived from the original (PDF) on 22 February 2014. Retrieved 28 July 2013. Ramsey, N. F. (2012). "History of Project A". In Coster-Mullen, John (ed.). Atom Bombs: The Top Secret Inside Story of Little Boy and Fat Man. United States: J. Coster-Mullen. OCLC 298514167. This page was last edited on 24 August 2018, at 21:28 (UTC).